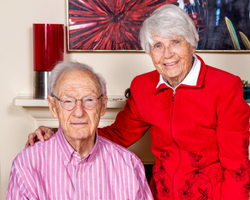 Richard and Dorothy Burkhardt moved to Muncie in 1952 when Richard was named Dean of Faculty at Ball State Teachers College. Richard served Ball State University in a variety of roles and ended his career as Provost. He retired in 1985. Dorothy taught in the Modern Languages and Classics Department at Ball State for 27 years. Her life-long fascination with France was exhibited in many ways: in cooking, in teaching, in travel, and in her promotion of cultural interchange between France and the United States. Of Richard’s several hobbies, sailing and photography were his special passions. He had been a saltwater sailor as a youth. Later, as a landlocked Midwesterner in Muncie, he was delighted when Prairie Creek Reservoir was created and he had the chance to take up freshwater sailing practically in his own backyard. Upon retiring from Ball State, he and Dorothy spent every summer in Egg Harbor, Wisconsin where the waters of Green Bay gave him further opportunity to enjoy being out on the water with his wife, family, and friends or simply messing around in boats at the water's edge. Richard was also an avid and award-winning member of the Muncie Camera Club and developed many of his own photographs. He loved woodworking and tennis. He and Dorothy loved to travel, and their adventures took them to both popular and remote destinations around the world. Dorothy was a Life Trustee of Knox College. She was also a member of the Conversation Club and the Art Alliance. She assisted The Community Foundation with grant programs, and she received an Outstanding Service Award from Meals on Wheels of Muncie. She loved gardening and also enjoyed needlework, painting, and sailing. Richard and Dorothy were lifelong champions of a wide range of charitable causes. They supported the efforts of Ball State University and Knox College in art, languages, history, and general education. In Muncie, they were both contributors to and volunteers for Habitat for Humanity, Motivate Our Minds, and The Community Foundation of Muncie and Delaware County. The Burkhardts requested that the Richard W. and Dorothy J. Burkhardt Fund be created as a way to continue to support those organizations that they valued after they were gone. This non-permanent fund provides support for 17 different nonprofit organizations that the Burkhardts specifically named. The Fund was established as part of their estate plan after both Richard and Dorthy passed in 2014. It carries on their legacy of dedication and commitment to the community. Alpha Center provides day services for seniors in the community. In 2017, Greater Muncie Habitat for Humanity user their distribution from the Burkhardt fund supported the relocation costs to move ReStore to a new location. The Community Foundation is glad we could help the Burkhardts continue their legacy in Delaware County.